All-powerful Father, may we who celebrate the feast of St. Bonaventure always benefit from his wisdom and follow the example of his love. Grant this through our Lord Jesus Christ, your Son, who lives and reigns with you and the Holy Spirit, one God, for ever and ever. Amen. 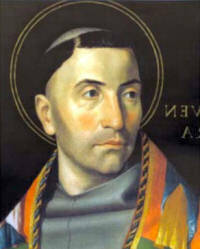 St. Bonaventure was born in Italy in 1221. He joined the Franciscan Order and went to Paris for his studies. He was made General of his Order and deserves to be reckoned its second founder for his work in consolidating an institution that was as yet ill-defined in nature. St. Bonaventure died at Lyons in 1274 during the general Council between Greeks and Latins held in this city. Dante had already included him among the inhabitants of his "Paradise". He is known as the Seraphic Doctor. Before the reform of the General Roman Calendar today was the feast of St. Henry, whose optional memorial is now observed on July 13. In England this day is known as "St. Swithin's Day", celebrating the day his relics were transferred. The Catholic Church celebrates his feast on July 2. "In Bonaventure we meet a unique personality. He was unsurpassed in sanctity, wisdom, eloquence, and gifted with a remarkable skill of accomplishing things, a heart full of love, a winning disposition, benevolent, affable, pious, charitable, rich in virtue, beloved by God and man. . . . The Lord endowed him with such a charming disposition that everyone who saw him was immediately attracted to him." In these words the historian of the Council of Lyons concludes his account on St. Bonaventure. At an early age he was a celebrated teacher and a powerful preacher. At thirty-six he was called to the highest post among the Franciscans, the Order which honors him as a second founder. He was an important figure at the Council of Lyons. His virtue and wisdom, his versatility and mildness were major factors in attaining the happy result that the Greeks so easily returned to the unity of the Church. Bonaventure was a subtle scholastic and a profound mystic. Because of the latter he is known as the "Seraphic Teacher." In philosophy he was the principal leader of the Platonic-Augustinian school of Franciscan thought; as such he stood opposed to the Aristotelianism that was making its way into the schools of the time (Thomas of Aquin). Bonaventure's Life of St. Francis was a favorite book of the Middle Ages. When St. Thomas was told about Bonaventure's work, he said: "Let us allow one saint to labor for another." His contemporaries are said to have believed that no one was "more handsome, more holy, or more learned" than he. Symbols: Cardinal's hat; ciborium; communion. Often portrayed as: Cardinal in Franciscan robes, usually reading or writing. Read a lenghtier account of St. Bonaventure's life in the Catholic Encyclopedia. In Journey of the Mind to God St. Bonaventure wrote: "I propose the following speculations to be free for those willing to magnify, admire and even take a taste of God, intimating, that too little or nothing is the proposed, exterior gaze [speculum], unless the mirror [speculum] of our mind has been wiped and polished. Exert yourself, therefore, man of God, before [prius ad] the sting of conscience bites again, and before you raise your eyes towards the rays of wisdom glittering in His reflections [speculis], lest by chance from the sight [speculatione] itself of the rays you fall into the more grave pit of shadows." You can read the entire work available at the here or purchase a copy from Amazon. For even more of St. Bonaventure's works you can visit the Franciscan Archives. This weather patronage traces back to July 15, 871 when the monks were translating his body (relics) from the outdoor grave to an indoor shrine in the Cathedral. The saint apparently did not approve, as it rained for 40 days afterward. See July 2 for more biographical details of this saint.